Whilst wandering about the Newtown Pentacle one fine summer day, your humble narrator encountered a maintenance crew from Weisbach performing some sort of upkeep on a traffic signal light. This is one of the newer ones, the kind which have two switch boxes attached, of the sort that has populating Northern Blvd. for the last few years. 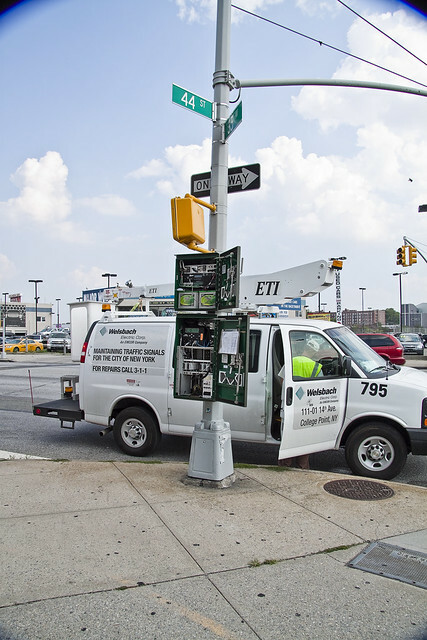 Specialty contractor Welsbach Electric provides outdoor electrical construction, installation, and maintenance services for utilities and public and private clients in New York City and Long Island. 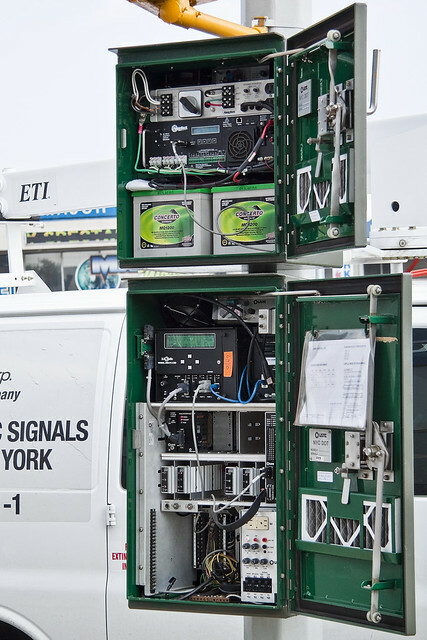 The company builds and installs roadway traffic signals, power stations, stadium lighting systems, underground transmission circuits, and other specialized systems. It maintains a fleet of more than 300 aerial and handling vehicles. Welsbach Electric was founded more than a century ago; it was acquired by construction group EMCOR in 1971. Normally hidden within the steel enclosure, the intricate works and electronica were exposed for the technician’s egress, and I took the opportunity to crack out a few shots of its innards. 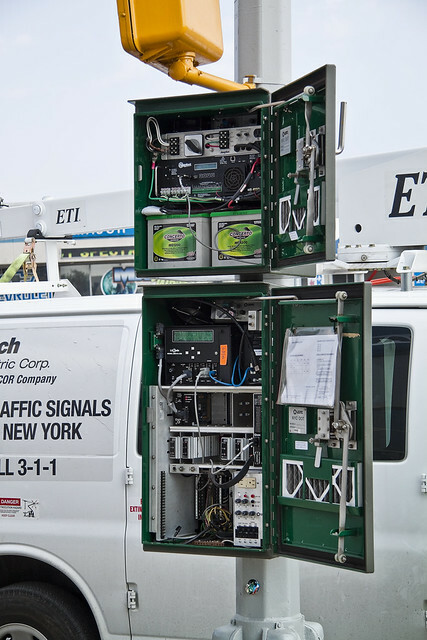 Byzantine, complex, and strangely advanced machinery seems to govern the actions of the traffic signal- a 4 way device which handles the busy corner of 44th street and Northern Blvd. near Major Auto World. (i) Vehicular traffic facing such signals may proceed straight through orturn right or left unless a sign at such place prohibits any such movement.But vehicular traffic, including vehicles turning right or left, shall yield theright of way to other vehicles and to pedestrians lawfully within theintersection or an adjacent crosswalk at the time such signal is exhibited. (ii) Pedestrians facing such signal may proceed across the roadwaywithin any crosswalk. (i) Vehicular traffic facing such signal is thereby warned that the redsignal will be exhibited immediately thereafter and such vehicular trafficshall not enter the intersection when the red signal is exhibited. (ii) Pedestrians facing such signal are thereby warned that there isinsufficient time to cross the roadway, and shall not enter or cross theroadway. Pedestrians already in the roadway shall proceed to the nearestsafety island or sidewalk. (i) Vehicular traffic facing such signal shall stop before entering thecrosswalk on the near side of the intersection or, if none, then beforeentering the intersection and shall remain standing until an indication toproceed is shown. (ii) Notwithstanding the foregoing provisions of this subdivision (a), or any provisions of state law, an operator approaching an intersection where asign authorizes right or left turns on red signal may make such turn aftercoming to a complete stop, but shall yield the right of way to all vehiclesand pedestrians lawfully within the intersection. (iii) Pedestrians facing such signal shall not enter or cross the roadway. Holy Moley! What’s going on inside this thing? This looks like the extensive rack of electronic doodads used here at Newtown Pentacle HQ for photo retouching! Northern Boulevard from Queens Plaza to the Brooklyn Queens Expressway (2.2 miles)This corridor runs east-west route in northern Queens and provides a major connection to the Queensboro Bridge. The corridor has direct access to the Brooklyn-Queens Expressway in the east, a location that has undergone a massive reconstruction, and to the Manhattan CBD by way of the Queensboro Bridge in the west. The reconstruction of the BQE has resulted in a change in traffic patterns at the intersection, especially for motorists wishing to access the expressway toward Brooklyn. Northern Boulevard is a wide corridor with significant auto-related and large, stand-alone commercial retail stores. There are light pedestrian volumes and some residential land uses. The corridor is also a through truck route. There are three subway stops along this portion of Northern Boulevard where the R, V and G trains can be accessed and an N/W station one block away on 39th Ave. The Q101 and Q66 bus routes operate along a portion of the study corridor.